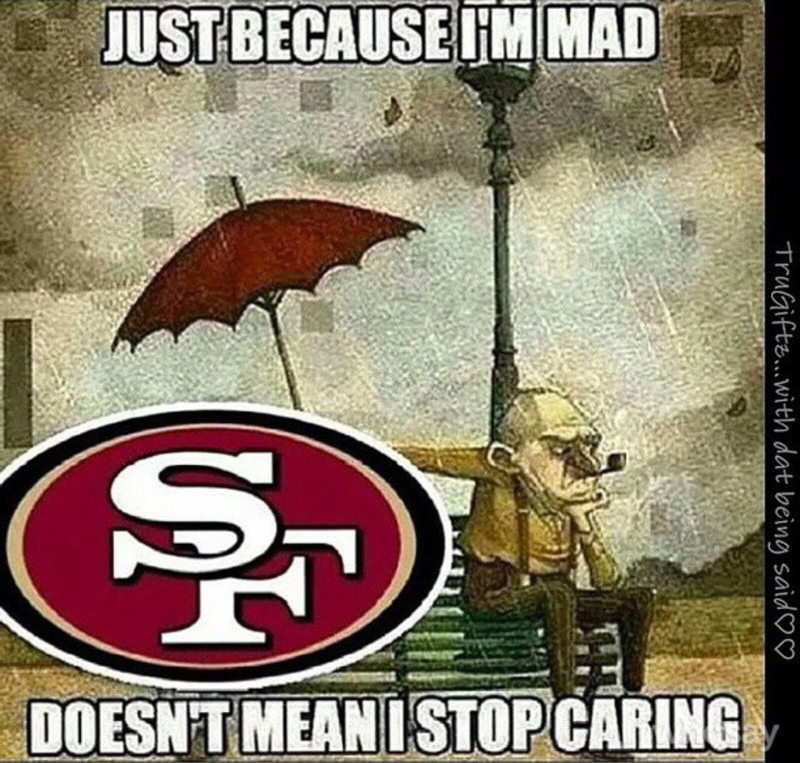 This picture sums up my feelings about my beloved San Francisco 49ers perfectly. Well, it sums up exactly how I feel about our front office. Rarely am I speechless but the past few weeks have left me with few words and a lot of head shaking. Let’s see, we have lost Frank Gore, Mike Iupati & it looks like Michael Crabtree is next. Patrick Willis retired. Chris Borland shocked the world and retired at the age of 24. Justin Smith is rumored to retire. And please do not make me go back and talk about Jim Harbaugh’s departure. Yeah yeah, the retirements are not the front offices fault but it does not lessen the sting. Especially not when we have lost so much production in other areas. It is going to take some time for me to get over losing Gore. Talk about stunned. I really do not know what to make of my beloved 49ers right now. The team is almost urecognizable. Never in my life have I seen such an exodus. Sad thing is, the exodus is so unnecessary but tell that to management and I am sure you will probably get the same look I have been giving them. It is as if they want us to have to rebuild but why? We already had most of the pieces in place. Just needed to plug some holes. Sadly, I wish I could say I am surprised that it has come to this. The writing has been on the wall. When the rumblings started about Harbaugh being “released” at the end of this past season, I knew we were dealing with some not so smart execs in the front office. I mean really? Who even entertains the notion of “releasing” a coach who has taken you to three straight NFC championships and was one play away from ring number 6? It just makes no sense whatsoever. There is no logical explanation for this ridiculousness. Can we trade our president and GM? Just sayin.